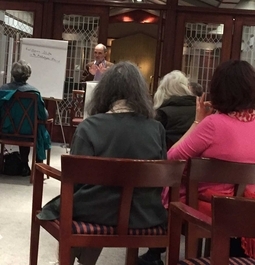 Right: Ken James discusses "The Evolution of the Psyche" from a Jungian perspective, a Common Ground program hosted by the Swedenborg Library in May, 2017. Location: James Parlor, on the 2nd floor of 77 W. Washington St. in Chicago. "Divine Providence" 32-session discussion group led by Karen Feil and Rev. Robert McCluskey. "Overview of the Bible" 9-session discussion group led by Rev. Robert McCluskey. "Parables of Jesus from a Swedenborg perspective," with Rev. Robert McCluskey and Karen Feil. "The 10 Commandments from a Swedenborgian View" with Rev. Robert McCluskey. "Swedenborg 101," "A Thoughtful Soul," Heaven & Hell," "The Heavenly City," "Miracles of Spiritual Growth," "The Gospel of Mark," and "A Book About Us," with Rev. Dr. George Dole. "Blake & Swedenborg," with Rev. Dr. David Fekete. "Swedenborg & Mesmer," with Dr. John Haller. "Proving God," with Ed Sylvia. "The White City: A Musical" with Lost & Found Productions. "George Inness & Swedenborg" at the Art Institute of Chicago. "Why Forgive?" with Richard Smoley of Quest Books. "Life After Life" with Dr. Raymond Moody. "The Mystic Heart of Justice," with Denise Breton. "The Devil & the White City," with Erik Larson, at the Cliff Dwellers Club. "Native American Justice" with Phil Cousineau, at the Siskel Film Center. "The Kabbalah" with Rabbi Cohen. Qi Gong practice, with Jim Kobus. "Goddesses," and "The Red Tent," with Mercy Gilpatrick. "C.S. Lewis - The Great Divorce," with Wayne Martindale. "Low-Key Genius: O.C. Simonds," with Barbara Geiger, at the Cliff Dwellers. "The Symbolism of the Tarot," with Paul Quinn. "Synchronicity, Tarot & the Joy of Wonderment" with Paul Quinn. "Invoking the Archangles" with Sunny Dawn Johnson. "The Art of Intuition workshop" with Sophy Burnham. "Angels Among Us" lecture, by Sophy Burnham. "Forgiveness Workshop" with Sophy Burnham. "A Course in Miracles" discussion group. "Nikola Tesla" with John Wasik, author of "Lightning Strikes: Timeless Lessons in Creativity from Nikola Tesla." "Lincoln in the Bardo" by George Saunders. "A Man Called Ove" by Fredrik Backman. "A Gentleman in Moscow" by Amor Towles. "The Intention Experiment" by Lynne McTaggert. "The Power of Eight" by Lynne McTaggert. "The Wisdom of a Meaningful LIfe" by John Bruna. "Dreams, Healing & the Self"
"The Evolution of the Psyche"
"Suffering & Happiness in Buddhism"
"The Changing Face of the Middle East"
"10 Reasons for Global Hope"
"Why Ayn Rand Ignites the Right"
"Genghis Khan: The Empire is Born"
"Sunnis & Shi'ites: Two Faces of Islam"
"Buddhism & Christianity-Contemplation & Action"
"Mysteries of Native America Spirituality"
"Science & Religion: The Long Entanglement"
"The Eleven Nations of North America"
"Nicea: When Jesus Became God"
"The Didache: The Teachings of the Twelve Disciples"
"The Gospel of Mary Magdala"
"Adam & Eve & Us"
"The Devil You Say: The Rite"
"Does Organized Religion Have a Future?" "Epic of the Persian Kings"
"Religions of Ancient Persia & the Abrahamic Faiths"
"Religious Terrorism in the 21st Century"
"The Three Faces of Iran"
"The Sunni - Shi'ite Divide"
"What Americans Need to Know About Islam"
"The Epic of the Persian Kings"
"Paul's Theology – Relevant or Obsolete?" "How Didi Noah Get All Those Animals on the Ark–Reflections on the Story of the Flood." "Misbehaving: The Science of Decision-Making"
"Innovation in Illinois Over the Past 200 Years"
"Dialog between Tom Campbell and IONS' Dean Radin"